It’s my pleasure to announce the launch of our new “Premium” HostPay Template, which is available for free to all our Reseller Hosting customers. This sleek new template comes bundled with all the necessary imagery and text placeholders which you can tailor for your own needs. It’s CSS driven so you’ll be able to change the look and feel with minimum effort, plus it’s fully standards compliant and passes the W3C validation test! 🙂 – You will also get the added benefit of rounded corners within Firefox & Safari browsers. We know creating a HostPay template can be a lengthy process, whether it’s building something yourself or hiring a separate development company. So we wanted to produce a template that we feel can be used almost instantly from the moment it’s installed, allowing you less time to develop and more time to sell! You’ll find this new template is now available within your Heart Internet customer control panel and can be installed in a matter of clicks! Check out the screenshots below of the new template. 1. Login in to your control panel. 3. Select the Theme you wish to have. 5. Navigate to your HostPay installation to see the new theme. I like the look of this one. Not as clean looking as the previous new ones in my opinion, but I think this I will appeal more to a certain market. Still not quite got around to setting mine up up, but I do intend to! Well done Ben! What a fabulous looking template. I’d be happy to start using that, especially as my design skills are almost non-existent… except that I don’t know how to change the template when my hostpay install is already live and the template would need a little tweaking. I reckon even templatemonster.com will be feeling threatened if they saw this. @ Eddie – Very pleased you would want to use this template because we wanted to make it as easy as possible for people to have a professional looking hosting company without the need to be a design/coding expert! – Like your comment re: templatemonster 😉 – if you need advice about the best way to upgrade feel free to shoot a message to customer support. We plan to release more “Premium” style templates in the near future. I agree, nice looking template. Thanks for all your great resources guys. Look forward to seeing more templates! This is nice template.. I’ll definitely set this theme.. Thanks again.. well, how we can restore our old data as i edited few more stuff with the old theme. The new template looks great. Just a suggestion but it would also be nice to release a guide to building your own design template. eg what is the main code that must be included in which pages (for the index, hosting, domains, checkout/ordernow etc). As there seems to be a lack of this information made available to resellers. Appreciate your suggestion regarding a “How-To” guide for building a HostPay template – this is something we may very well consider creating. 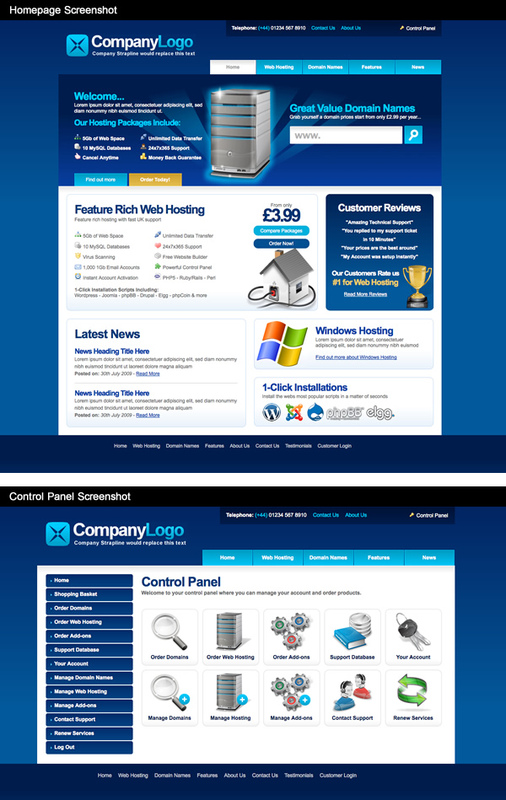 Creating a template is fairly straight forward as the main styling is controlled by the header & footer templates, this will also give the styling for the customer control panel. The front-end pages are all static so you can add whatever content you need.I would certainly suggest looking through the code within the files of thedefault installation of HostPay to get a good understanding of how it is built and how all the files are linked together. Template looks very professional and would like to use it, but the problem is, because I have made various changes etc to my previous template – these previously generated files seem to interfere even when the new template is activated.I’ve had to restore my old one as I can’t afford for my website to be a work in progress. Suggestion: As i’m sure most people will have their hosting website already live and can’t let it suffer whilst playing with the new template – would some sort of ‘sandbox/testing folder’ be available so the new template files are in a test address (allowing us to play with the code and new layout) whilst still keeping our hosting website up and running? Hope this makes sense – but thanks again for a great service!! Seeing as the front end pages are all static how could I like a button to buy a product to add it to the basket automatically rather than taking us to the order now page which is just another static page? I am assuming there would be a link for this. The guide would be great esspecially for showingt how to link the front end site with the hostpay system. Very nice template and I will use it, I hope, however I would echo Dave’s comments – a guide would make life a lot easier and get more resellers reselling to their maximum and I am sure bring more business to yourselves. Just want to say nice work on the latest template, it looks like HostPay is taking off and it should be a great tool for all resellers. I am in the first stages of implementing HostPay and it has every feature I could ever ask for, but just one suggestion which I have thjought of is a combined Support plugin, something like your very own customer service support tickets. Maybe with the API (which i havent looked into yet) we could bridge some 3rd party software that allows our own customer database link with a support software. Thats just a suggestion, I always like to see new features added to HostPay. Is there a working demo to fully check this new template? How about putting all the new premium reseller online so people can see them. You have screen shots and flash images but they are not clear.